In a human brain-cell model, a version of the APOE gene—APOE ε4, which increases a person's risk of developing Alzheimer's disease—has been successfully made harmless by using an innovative technique. A study funded in part by NIA and published April 9, 2018, in Nature Medicine shows a possible way to restore normal function to human neurons through the use of gene editing and a small molecule that changed a harmful protein. The APOE gene comes in several forms, or alleles. Having one copy of the APOE ε4 allele more than doubles a person's risk for developing late-onset Alzheimer's and is associated with an earlier age of disease onset. In contrast, the APOE ε3 allele neither increases nor decreases Alzheimer's risk. The APOE gene produces the ApoE protein, which can prompt a sequence of biochemical events leading to Alzheimer's-related damage in the brain. Researchers from the Gladstone Institute of Neurological Disease and the University of California, San Francisco derived brain cells from induced pluripotent stem cells—adult cells that have been programmed in a way that allows them to become any type of human cell—using skin cells from people with either APOE ε4 or APOE ε3 genes. Their observations showed that APOE ε4 triggers the development of various Alzheimer's pathologies in brain neurons, including an increase in APOE fragmentation, tau phosphorylation, production of beta-amyloid (a protein that accumulates into harmful plaques), and the degeneration or loss of GABAergic neurons (which affect neurotransmitters). The researchers determined how to neutralize the abnormalities caused by APOE. First, they used gene editing to convert the harmful form of the APOE gene to the neutral form, which removed the resulting protein's detrimental effects. In addition, the researchers used a small-molecule "corrector" they had previously developed to turn the ApoE4 protein into an ApoE3-like protein. The results were similar: Alzheimer's pathologies were reduced, and the cells' normal function was restored. The authors noted that the ApoE4 protein results in beta-amyloid production in human but not mouse neurons, and that conversion of ApoE4 to ApoE3 by gene editing significantly lowered beta-amyloid production, consistent with a specific effect of ApoE4. These results highlight the differences between mouse and human cellular models of Alzheimer's disease. 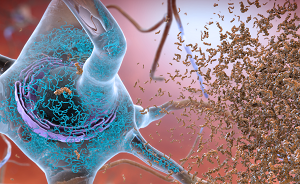 The new study offers a human model of Alzheimer's disease that may be useful for studying mechanisms underlying Alzheimer's disease and developing a "corrector" drug targeting ApoE4, which could be tested as a therapy for Alzheimer's.